Could Now Be The Time To Buy Lakefront Homes In Tallahassee? There are more niche's in the Tallahassee real estate market than one could possibly track, but lakefront homes will always be on my radar. There is nothing more tranquil than waking up in the morning to a cup of coffee and watching the mist rise off of the lake. I lived on a lake for more than five years, and I still miss those early morning hours. So I will continue monitoring lakefront homes in Tallahassee, and today's report shows why now is a great time to consider buying waterfront property. When we first examine the value of lakefront homes in Tallahassee, we see them move in a manner that is consistent with the rest of the Tallahassee real estate market. But when we track them in comparison to homes that sold which were not on a lake, we can then see there are market cycles that dictate the best time to buy a lakefront home. When we look at the real estate graph above, we see three important pieces of information plotted over time. The brown shaded area shows the average value (price per square foot) of all homes which are not on a lake from 2003 to mid-September 2013 (plotted on the left vertical axis). Similarly, the blue shaded area shows the average value of lakefront homes in Tallahassee (also measured on the left vertical axis). Finally, the green columns show what I refer to as the "Lakefront Premium" or the percentage increase of lakefront homes compared to non-lakefront homes. 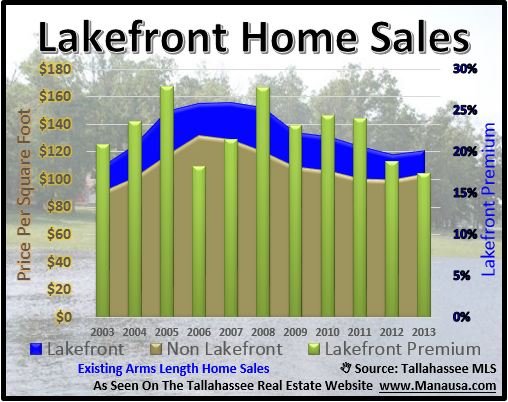 Currently, lakefront homes in Tallahassee are selling for roughly 17% more than non-lakefront homes. The normal lakefront premium is about 21%, and we saw it goes as high as 28% in 2008. This means the 17% lakefront premium today is the lowest we have seen in 11 years of tracking lakefront home sales in Tallahassee. If you have ever considered buying lakefront property, now could very well be the best time ever (when you factor in fallen prices, low interest rates, and the lowest lakefront premium on record). The following map shows all of the lakefront homes for sale in Tallahassee. Simply hover over a marker and a picture of the home will appear, as well as limited information on the home. If you want to know more about the home, simply click on the picture and the entire detail page will be revealed. I hope you were able to learn something from this Tallahassee lakefront home sales report, please drop me a note if you have any other questions or concerns that I can help you with.